Sayi and Savithri who are initially at loggerheads but eventually turn out to be the best of friends. However, when their bond goes through a bumpy ride will their friendship sustain? 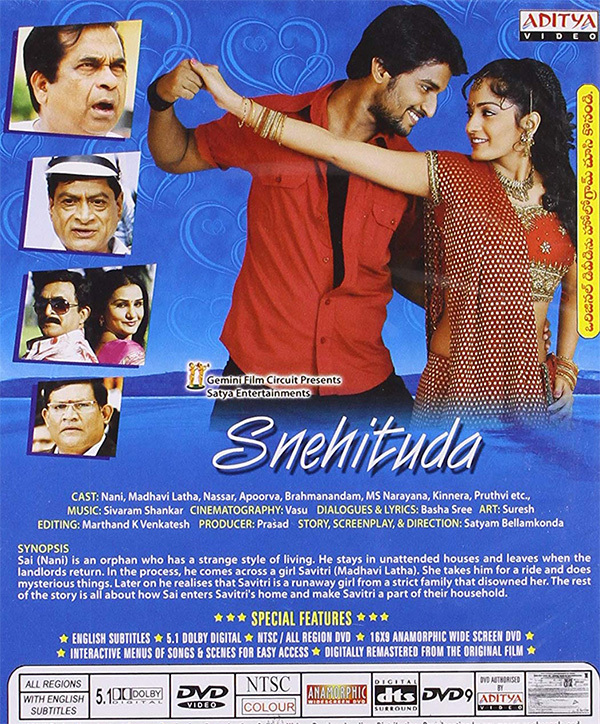 Snehithuda is about an orphan Naani who apparently is comfortable leading his life in the shadow of other's lives. One fails to understand how such a thing is possible but merely accepts this as one of the many afflictions that first time directors in Tollywood seem to be infected by. The core of the movie is how Naani rescues a runaway girl Madhavi Latha from the clutches of a brothel, and then befriends her before reuniting her with her father (Naseer in an impressive performance), not to mention winning her heart in the process. How does one orphan with no income or work to support him live so comfortably and does so many charitable things is beside the point and can simply be accepted as cinematic license. The rest of the movie is about how and why Madhavi Latha runs away from her home, the baddies she faces and defeats with Naani’s help and how they live happily ever after.